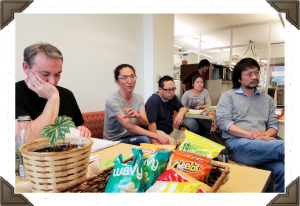 02/24/17 – Thanks to Kyaw (Joe) and Xiufang for sharing their Research Statements with us. Here at The Pub Club we are actively working to “Stay on the Edge of Science” and “Fill the Void.” Our reason for pursuing these objectives is to best position ourselves as the scientists who can tackle and provide solutions for the Big Questions and effectively communicate the relevance of our Key Findings to Diverse Audiences. For those of us hoping to achieve this goal within academe, one of the most critical elements of a successful application package is our Research Statement. 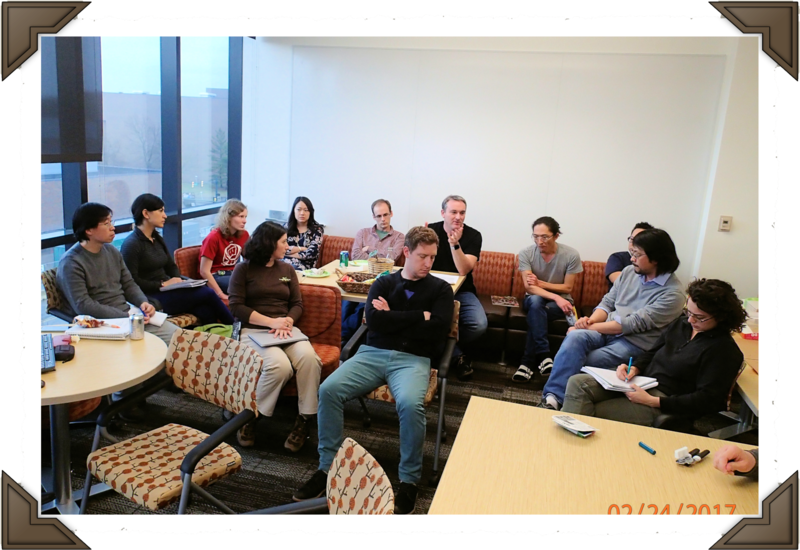 On February 24, 2017, The Pub Club sat down with our three PIs – Sheng Yang He, Brad Day and Gregg Howe – to discuss the topic of “How to Write a Standout Research Statement?” Two TPC members, Kyaw (Joe) Aung and Xiufang Xin, who are both actively applying and interviewing for tenure track faculty positions, shared their Research Statements for critical evaluation to facilitate our conversation. This post is a summary of the feedback and discussion that resulted. Q: What makes a “good” or “bad” research statement (RS)? 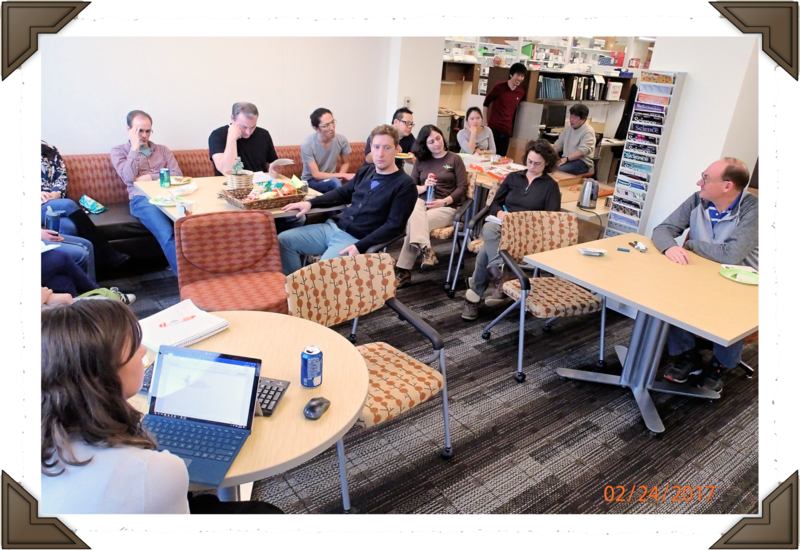 02/24/17 – Miranda kicks off our TPC Gathering focused on Research Statements. Miranda Haus got us rolling with this simple question: What makes a RS “good” or “bad”? Our PIs were in agreement that poor grammar and spelling are automatic turn-offs as they indicate laziness. If you did not take the time to edit your written thoughts, why should anyone else take the time to read them? In regards to what takes a RS from being just OK to standing out in the pile (which Sheng Yang mentioned can be >50 at a time!)? Gregg said he wants to read something new and exciting. He is looking for someone who sounds like a potential colleague. Brad agreed, saying we should start with a hook. Make the reader curious to know more. 02/24/17 – Gregg Howe highlights the importance of the RS – more important than what you have published. Question is, can you stand on your own ideas? Q: What is the relative importance of the RS within the application package? 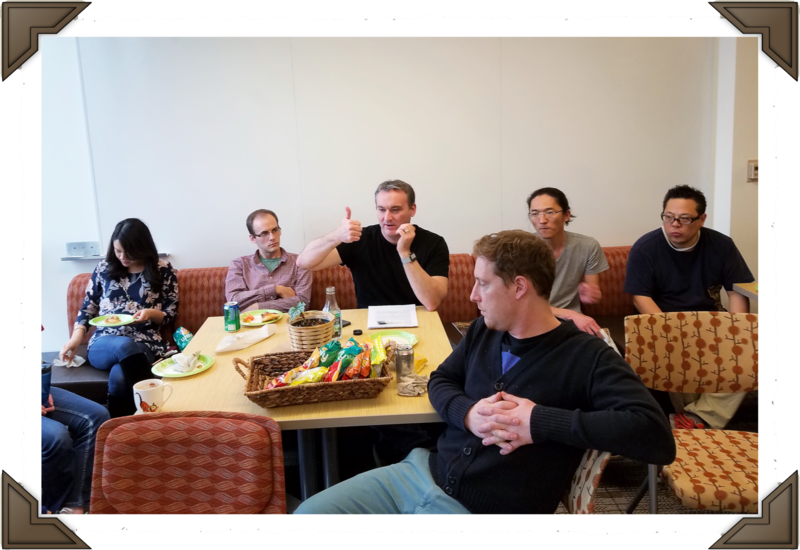 In response to Kyaw’s question regarding the relative importance of the RS to other elements of the application package, Gregg emphasized its value. While having a record of publications is important, the number of publications on your CV will not automatically qualify or disqualify you. Gregg explained that a search committee is looking for someone with novel research ideas that have a strong likelihood of being funded. There are many reasons that affect the number of papers and where they were published. Your RS provides the basis of determining whether or not you have what it takes to secure your own funding – independent of a mentor – to successfully pursue an independent line of inquiry. Q: What format is best? Kyaw mentioned that framing your RS as a proposal is useful as you will need “specific aims” for your interview chalk talk. Ian supported this saying each aim should be a title of a different grant proposal. Sheng Yang recommends using a diagram to both interest the reader and make it easy for them to quickly see the Big Ideas and Novel Approaches you plan to pursue. This also helps with conceptual understanding and retention. Remember that many of your readers will be in a field different from yours, so focusing on the Big Concepts is key. 02/24/17 – Brad explains that with 50+ statements to read, he will decide quickly if a RS is good or bad. The biggest thing that will make your RS stand out is describing the Big Picture – Why is this important? What is the Big Question or Challenge the work will address? – and work down to the details of how your take on the question will lead to new advances within the field. In terms of approach, it really is about your unique take on the Big Question rather than the methods you will use. Nothing inspires a yawn like “I will do RNA-Seq with a time course…”! Our PIs advised us to focus more on what the data generated using X, Y, Z approach will tell us rather than the methods themselves. In response to Xiufang’s question regarding the amount of preliminary data we should have, Gregg answered that preliminary data is not that important. The main thing is demonstrating whether the work we propose has a strong chance of getting funded. Along that line, it is very good to include specific sources of potential funding. This shows we have actually thought about and have a strategy for obtaining the means to pursue and achieve our research goals. When describing our plans, we want to be sure to demonstrate that these are OUR ideas, not merely an extension of our previous professor’s work. However, it is good to be clear about what work we are authorized to take with us from our former lab in terms of materials and specific lines of inquiry. While the RS should primarily contain our plans for future work, our PIs all agreed that it is good to highlight anything from our previous work that was REALLY great, just don’t overdo it. 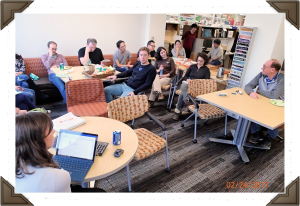 Focus on contributions we made during our PhD and postdoc that moved our field forward and/or that positioned us to do the work we are proposing. When doing this, be sure your statements are fact-based and not overly self-aggrandizing. Kyaw suggested, if you run out of space in the RS, you can include them in the cover letter instead. This is a great way to demonstrate how your previous work sets you up to do the work you are planning. Brad encouraged us to draw attention to statements that reflect what you have done in the past and the potential impact of what you plan to do in the future. While you don’t want to highlight every other word or sentence, you also don’t want to bury statements highlighting the relevance of your work! On that note, do not artificially inflate the relevance of your work using words like “exciting” or “novel.” Rather, let the importance of your ideas and findings speak for themselves. Q: When should we start working on a RS? 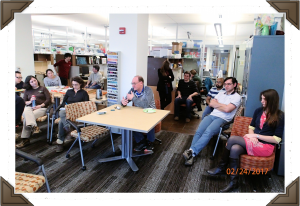 02/24/17 – TPC members listen attentively and take notes on our PIs advice for Writing a Standout Research Statement. Sheng Yang’s answer to this for postdocs is: Start Now! One of the most important things a PI does is writing, therefore, the best way we can prepare ourselves to be successful PIs is to start writing now. During his PhD, Sheng Yang would start writing his manuscript drafts as soon as he had some foundational data. While these early versions looked nothing like the draft that would finally be submitted, he found the practice of writing up his findings helped to direct his work in the lab. 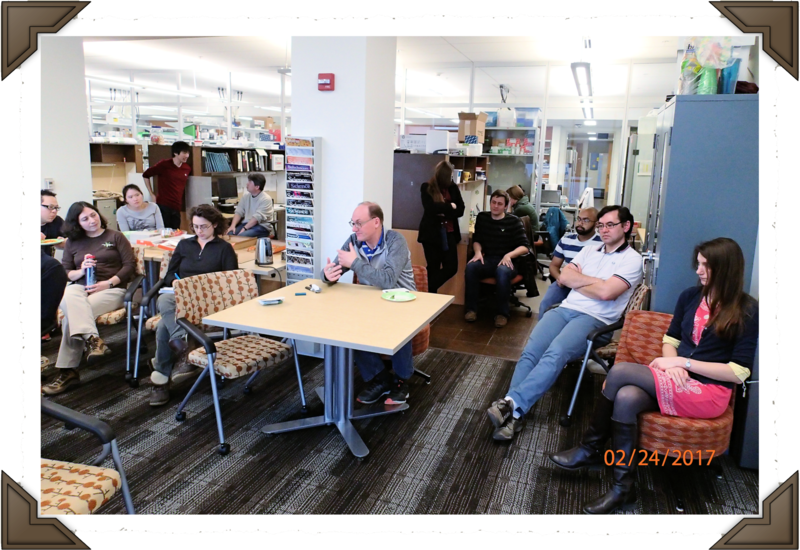 He says many graduate students and postdocs work really hard at the bench only to find out that much of their efforts cannot be published because, while each experiment may have been sound, they don’t work together to produce a comprehensive story. Taking the time to refine our ability to Identify the Big Questions, Novel Approaches and the Relevance of our Key Findings throughout our training is the best preparation for defining, “selling” and successfully implementing our own, independent research program down the road. 1. Emphasize YOUR Big Ideas and Novel Approaches. 2. Use simple Graphics to depict Concepts. 3. Demonstrate your potential as a colleague by highlighting your previous and potential contributions to the field. 4. Provide specific potential sources of funding to lend weight to the likelihood of your success. 5. Start early, get feedback and be sure to remove all spelling & grammar errors prior to submission!